With 15 days left to go before closing his blog, J-Walk has already started to descend into puns with a link to a site discussing the growing trend of corn mazes. 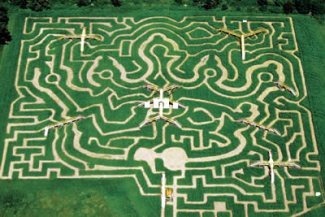 Yes, actual corn mazes. I'll admit, it grew on me. In any case, those interested in maizes (darn it, now he has me doing it) should be a pedestrian in Kuala Lumpur. The shape and intersection of their road network could be used as a source of high entropy random numbers.